Freshman Lauren Desrats poured in a career-high 19 points as the Mount Saint Mary College Women’s Basketball team held off a furious Farmingdale State fourth quarter comeback to defeat the Rams 63-61. NEWBURGH – Freshman Lauren Desrats poured in a career-high 19 points as the Mount Saint Mary College Women’s Basketball team held off a furious Farmingdale State fourth quarter comeback to defeat the Rams 63-61. The victory pushes the Knights win streak to 10 games and extended their unbeaten conference record. The Rams jumped out to a 6-2 lead following two Nia Miller threes and then the Mount responded with a 7-0 run capped off by a Toriana Tabasco jumper. The Knights finished the quarter with an 11-8 advantage following two Kayla Cleare free throws. The Mount scored six quick points to start the quarter, including a Lyndsay Pace three-pointer, to push the lead to nine. Farmingdale State responded with a 13-1 run to take a three point lead with 3:18 remaining in the second quarter, led by Destiny Hurt’s eight points. The Knights closed the quarter on a 10-0 run, including a three-pointer from both Annie Keenan and Desrats, to take a seven point lead into the halftime intermission. The Knights finished the first half shooting 32.1-percent and knocked down four triples as the Rams were held to 28.1-percent as a team and 2-for-12 from the three-point line. Pace finished the first half with a team-high nine points and Cleare had six rebounds at the break. The Mount exploded early in the first few minutes of the third quarter with Desrats knocking down four straight triples to begin the half on an 14-2 run. A Katie Smith jumper pushed the lead to a game-high 21 points as the Knights took a 19 point lead into the final stanza. The Rams began the final quarter on a 9-0 run to cut the lead to 10 with 7:57 remaining before Tabasco knocked down her only three of the game to end the run. After Smith hit a three-pointer with 2:27 to go in the contest to give the Knights a 12 point lead, the Rams mounted a furious comeback in the final minutes. Farmingdale State rattled off a 10-0 run in just over a minute to cut the lead to three points with 57 seconds remaining. 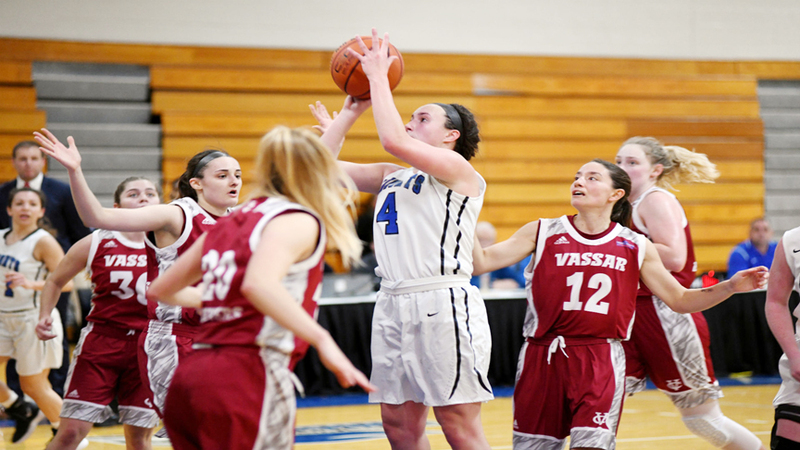 Following a Cleare made free throw, the Rams could only manage to make two free throws down the stretch as the Mount held on for a two point victory. Desrats poured in 16 points in the second half, including four triples, to push the Knights to victory. The Knights finished the half shooting 40.6-percent from the field and the Rams shot 39.4-percent. Each team knocked down seven threes and Farmingdale State outscored the Mount by five at the free throw line. Desrats finished the day 7-for-14 from the field and 5-for-11 from three point range and added two rebounds and two assists. Pace added 12 points, four boards and two assists while Cleare chipped in nine points and 11 rebounds. Smith had eight points and five assists as Keenan added a team-high six assists and nine rebounds. Hurt led the way for the Rams with 18 points, seven rebounds, five steals and four assists. Miller added 16 points, seven assists and six rebounds while Selena LaFranca chipped in 15 points and Alexis Hunter grabbed 15 boards. Mount Saint Mary shot 36.7-percent compared to Farmingdale State’s 33.8-percent and buried two more threes than Farmingdale State. The Mount outscored the Rams 19-16 in points off turnovers and Farmingdale State outscored the Knights 16-14. The teams were even in rebounding at 44 apiece and even in second chance points at 10. The Knights are 18-4 overall and a perfect 15-0 in the Skyline Conference.